Shapes on the landscape are all around. Barrows - Barrows were introduced during the Beaker phase. They are a burial cist or grave covered with a mound of earth. They come in two styles; long barrows or round barrows. 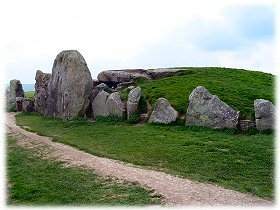 Long Barrows - Rectangular mounds of earth and/or stones used for inhumations and cremation burials. Bell Barrows - Circular mounds which have a flat platform, before the encircling ditch. They usually contain male burials. Disc - A flat circular area, surrounded by both a ditch and a bank. A small tump of earth in the centre marks the position of the grave itself. They usually contain female burials. 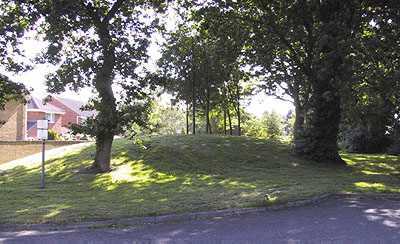 Bowl Barrows - Circular mounds which are sometimes accompanied by a surrounding ditch. 3. A mound or bank of earth, used especially as a barrier or to provide insulation. Etymology: French berme, from Dutch berm, from Middle Dutch bærm, berme. Cursus - A long, linear enclosure formed by a parallel bank and/or ditch. They are thought to have been used for ceremonial processions, as like many megalithic monuments they are aligned with the midsummer sunrise. The spread of these monuments is quite extensive. Examples have been found as far apart as Norfolk and the Orkneys. Some of them run for miles across the landscape. 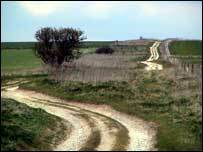 The Dorset Cursus on Cranbourne Chase runs for six miles and is the longest known. The name comes from the Latin for racecourse, as early investigators of these monuments thought they were Roman structures used for chariot racing. 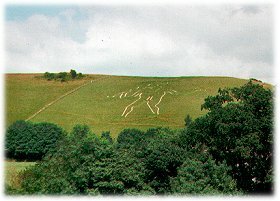 Hill Figures - Giant figures of humans or animals, which are carved out of chalk hillsides in Southern England. Hill Forts - These were, as the name suggests, fortified defensive settlements on the top of hills. They were chiefly occupied by the Iron Age Celtic tribes, but some sites had been in use since the Neolithic and some lasted well into the Roman period. 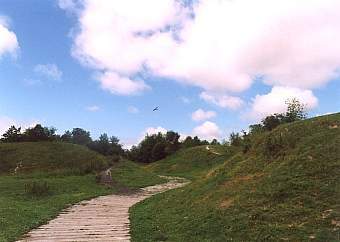 The Celts updated the old wooden fortifications by digging out large earth ramparts, which often wound mazelike around the settlement to confuse the enemy. Maiden Hill Fort, a huge hillfort, that can be seen from miles around, was in use in one form or another for something like 3500 years and consists of 3 separate occupation periods and construction projects. The first use of the site was during the Neolithic period. A causewayed enclosure consisting of 2 banks 15 metres apart was constructed sometime between 3000-2000 BC at the eastern end of the hill enclosing an area of about 8 hectares. About half a millennium later a 500 metre bank was built running northwest to southeast - the burials of 2 young children were found beneath the eastern end. Lynchettes are created either unintentionally by ploughing or intentionally in the hilly landscape to create terraces suitable for farming. 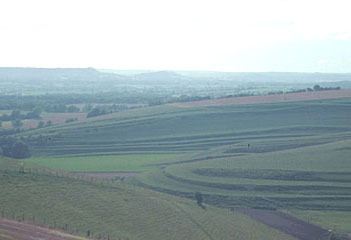 This pressure for more agricultural land, led to the creation of lynchettes, a form of terracing. Lynchette patterns can be seen in the above photograph. Much of Butser Hill and sites on Holt and War Down have Scheduled Ancient Monument Status as designated by English Heritage. These features include trackways, barrows, lynchets and the site of a Roman farmstead. 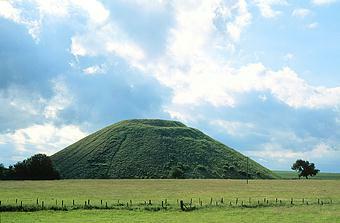 Silbury Hill, located just south of the village of Avebury in Wiltshire, is a massive artificial mound with a flat top. It is approximately 130 feet (40 m.) high, with a base circumference of 1640 feet. It is composed of over 12 million cubic feet (339,600 cubic m.) of chalk and earth and covers over 5 acres (2 ha). Silbury Hill occupies a low-lying site and except at certain points in the landscape, it does not protrude significantly above the horizon. The Wiltshire stretch of the Ridgeway is the most remote section of the entire route and runs along the ridge of archaeologically rich downland between Overton Hill and Uffington White Horse, on the Oxfordshire borders.The route has been in constant use for 4000 years and some believe it continued beyond Wiltshire, heading south into Dorset and on to the coast. 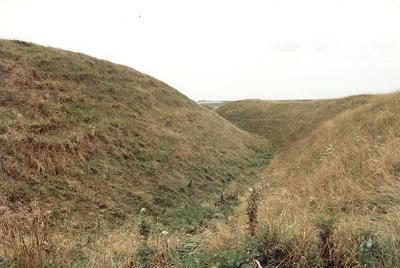 Iron Age forts, Barbury Castle. stand beside a busy road. with dark forces of magic. What exactly is a barrow? of the site near Ringlemere. each with stories to tell. and a very fine job it is too. places of spirituality in England. Chalk downland combines gracefully with low lying pastures while Wiltshire's woodland and forests are reminders of the county's past.